As an exercise I built a new 555 timer based servo tester. I built a similar one in the early 80s on Vero-board and attached to a piece of ply with a scale drawn on it. Note the small push-button on the board. This must be pressed and held to connect the PPM signal to the servo connector. 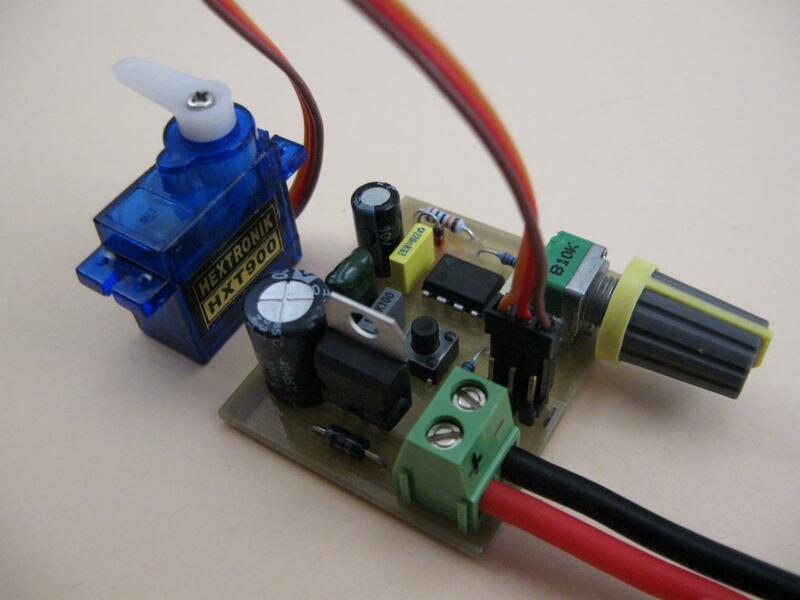 The idea is that the servo or speed controller won’t do anything until you press the button. The board has two 3-pin servo connections. 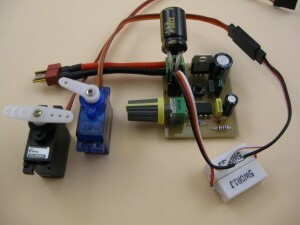 These can connect two servos or a servo and a ESC or a plug-in filter capacitor. 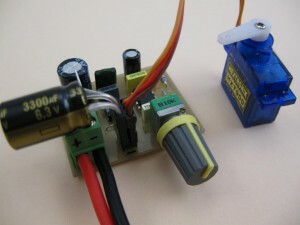 The 5 volt regulator allows it to operate from a 2 or 3 cell LiPo or other supply. Useful supply voltage range is about 8 to 15 volts. Too low and operation may be erratic, too high and the regulator may overheat. Absolute maximum supply voltage is 25V DC. 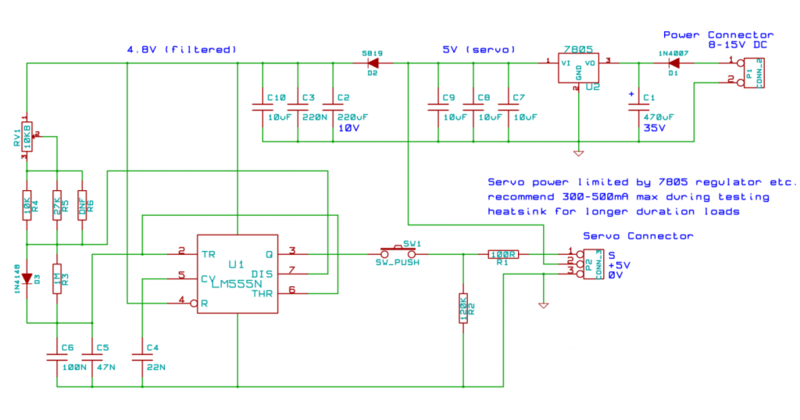 The 555 timer circuit is somewhat isolated from the servo power but a noisy (digital) or large servo can interfere with the timer and make the servo shudder. A couple of solutions: Power the servo from a separate BEC and/or add extra filtering to the servo supply; see below. The 555 timer has been around for years; since 1972. Wikipedia. It’s quite simple but very versatile and has been put to many ingenious uses. It charges a capacitor via a resistor for timing. In this application it generates a series of PPM pulses, variable from about 1 to 2 mS, repeating at about 20mS. With the right resistor values the pulse time minimum-maximum and spacing can be determined. Unlike a crystal locked microcontroller, the timing here is close but not precise due to component variations. For this application it doesn’t matter. Because the pulse generation is entirely linear, it doesn’t step like a micro generated pulse does. This allows very fine control of the servo; generally more precisely than most cheaper servos can follow. The power supply passes through a series Diode to protect against reverse supply connection. This passes through a 5V 1 Amp regulator and supplies the servo connector. 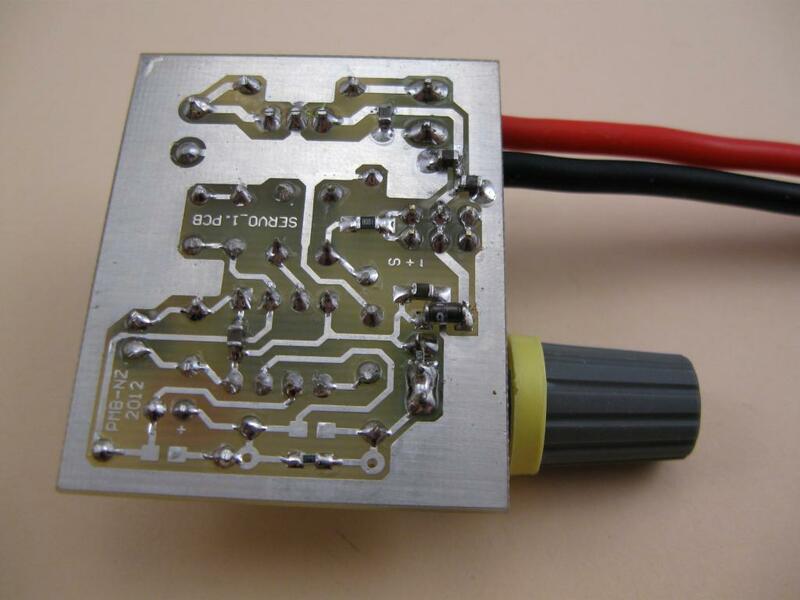 This 5V also passes through the low-drop schotky barrier diode D2 to supply the 555 timer with approximately 4.8V. D2 and the 220uF capacitor clean up the supply to the 555 timer reducing the noise and voltage fluctuations caused by connected servos. The 5V regulator, although rated at 1 Amp, will get hot with continuous load current. The higher the supply voltage, the quicker and hotter it will get. Don’t over-heat it.. The board is single sided and assembled with mostly through-hole components. There are a few SMD components on the bottom of the board. The Diode D2 is a SMD type as well as some 10uF ceramic capacitors. Some of the timing resistors allow through-hole and/or SMD to be used. A primary through-hole resistor can be trimmed with a parallel higher value SMD resistor to adjust the timing. Servos, especially digital servos can cause a lot interference on the 5V supply. An extra filter capacitor can be added to reduce noise and voltage fluctuations. The capacitor should be a low-ESR type (most reasonable modern capacitors now are) and connected with wires as short as possible. I’ve used capacitors intended for PC motherboards etc. rated 2200 to 3300 uF and 6.3 volts. Example: the Corona DS-919MG digital servo draws short high current pulses. Without the filter capacitor the supply drops by about 2.5 volts during these pulses. With the capacitor as shown, the supply drops by a lesser 0.5 volts during these pulses. This is noise on the 5V supply that is also seen by the receiver. Current and voltage tests were done using a in-line current sense resistor of 0.05 ohms and a digital storage scope. Voltage and current measurement were taken at the sense resistor. Tests were done with and without the additional filter capacitor. Power was supplied from a 3-cell 2200mAh LiPo. At no load these servos draw 2 to 5 mS pulses of about 600mA repeating at 20mS. Increasing the load on the servo increases the pulse length. This causes voltage drops of about 35mV, with and without the additional filtering. Any movement or load on the servo causes it to draw high current pulses that can peak at about 9 Amps of 10uS repeating varying between 800 and 1600 uS. When the supply cannot deliver the peak current, the pulse duration increases so the average power draw stays about the same. As load on the servo increases, the repeat rate of the current pulses increases. These current pulses are quite nasty on the supply. To reduce noise on the supply and voltage drops, the supply must be able to deliver high peak currents and be well filtered. If the supply can’t deliver, it may interfere with other equipment on the same supply; receiver, other servos etc.